Something I recently discovered, while trying to figure out an Aeroplan transfer is that you can transfer Aeroplan miles to US Airways Dividend miles at a pretty decent rate. 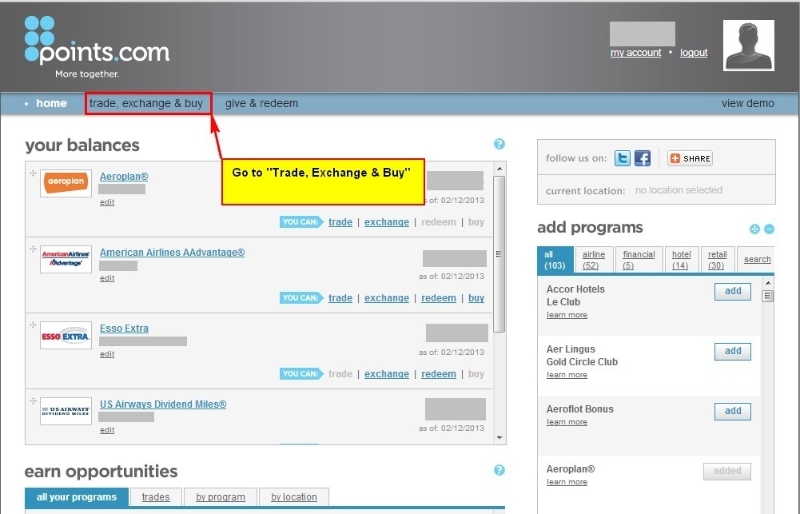 In this article, I’ll show you how to exploit this to take advantage of some of the great parts of the US Airways award chart and know when it makes sense to transfer your Aeroplan miles to US Airways miles. Something I recently discovered, while trying to figure out an Aeroplan transfer is that you can transfer Aeroplan miles to US Airways Dividend miles at a pretty decent rate. This opens up so many possibilities to people who understand where each of the 2 program’s strengths are. The Points Guy does a good job of discussing some of the ways to utilize this if you are interested in turning your American Express Membership Rewards (US program) to US Airways Dividend Miles. You have to transfer a minimum of 15K Aeroplan Miles. Update: It turns out that the exchange rate is actually dependent on the country where your Aeroplan profile is set to. This exchange rate is based on my account, whose address is set to the US. I’ll let you figure out what you need to get this exchange rate should you want it. Shame on Aeroplan for discriminating against Canadian addresses. There is a limit of 100K Aeroplan miles transfered out each year and 50K Aeroplan miles transferred out in any single transaction. Bear this in mind when planning your transfers. As we have discussed, both US Airways and Air Canada (Aeroplan) are part of the Star Alliance and both have access to essentially the same pool of flights available for award flight redemption. So, if we cant get access to more flights, why would anyone want to trade their Aeroplan miles for US Airways miles? In the article I commented on the hefty taxes and surcharges that are added to Aeroplan flight redemptions. The fuel surcharge, which can make up a large part of the “taxes, fees and surcharges” is levied on flights operated by Air Canada (among other airlines). As a result, it is wise to avoid redeeming Aeroplan miles for flights operated by Air Canada or other carriers that charge a fuel surcharge. US Airways Dividend miles redemptions do not have an associated fuel surcharge, even on those exact same flights. If you were to transfer your miles, you would have less miles for use, but the taxes and fees might be reduced by more than enough to offset this loss of miles. This way, you do not have to avoid certain airlines when redeeming miles. For Canadians, the best time to use this would be if you are flying from Canadian cities and you value flying on Air Canada operated flights when going long distances. There are some instances where the award charts differ. 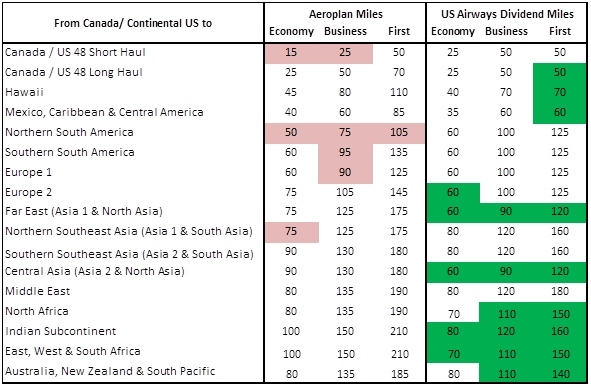 This means that certain routes will cost a different number of Areoplan miles as US Airways miles. If we can find the situations where it costs fewer US Airways miles than Aeroplan miles (enough to offset the loss in the transfer) then it makes sense to transfer the miles. The prime example of when this makes sense is flying North America to East Africa. It costs 100K Aeroplan miles vs 70K US Airways Dividend miles to fly economy from North America to East Africa. Instead of buying your ticket from Aeroplan for 100K miles, you could transfer 84K miles to US Airways Dividend miles and redeem those for the exact same flights. You can save 16K miles by doing this. That’s enough for a North America – Short Haul ticket! I will let you compare the charts for flights not originating in North America. Let’s look at the zones where we can exploit this for flights from North America. On most routes, it costs fewer US Airways miles than Aeroplan miles. The zones that are hilited in green are ones where the mileage savings more than make up for the loss in the transfer. Something to bear in mind is that these discounts are only eligible on flights that are operated by US Airways. There is no partner travel allowed for the discounted rates. If you are fortunate enough to have the US Airways Premier World Mastercard, you know that you get a discount of 5K miles on each award flight redemption. This is one of the great perks of having the card. Having the 5K discount could be a difference maker in this case but is more likely to work out to be a nice added bonus. Most of the time, the 5K that you are saving will be lost in the transfer. It is also unlikely that you will save much on the taxes and fees since all flights have to be operated by US Airways and Aeroplan awards do not charge fuel surcharges on flights operated by US Airways. You might actually spend more since there are some standard booking fees on US Airways that do not exist on Aeroplan bookings. Having a way to easily transfer Aeroplan miles into US Airways dividend miles for very little loss is great. Without this ability, any amount of US Airways Dividend miles less than 25K was pretty much useless. This reduces the motivation to do things that get small amounts for little effort. Now that those small amounts of miles can be added to easily, it makes them so much more valuable. US Airways has also become the low cost seller of Star Alliance miles. They often run promotions, such as the Grand Slam and buy / share miles promotions, where miles can be earned very easily and cheaply (sometimes as low as $0.012 / mile). The ability to transfer Aeroplan miles to US Airways Dividend miles makes those promotions so much more rewarding. I have heard so many people tell me that they need help using up their miles before they expire, or that they have lost their miles because they expired / didnt have enough usage on their account. The US Airways transfer is a great way to avoid the mileage expiration policy. Aeroplan miles currently have a lifetime of 7 years from the date of issuance to expiration. Sometimes, you just can’t use up your Aeroplan miles before they expire. Having an option to transfer them to US Airways miles prior to expiration is great. Knowing that you can transfer your Aeroplan miles into US Airwyas can extend the life of your miles indefinitely. One caveat, however, is that you have to have activity on your US Airways account every 18 months, similar to Aeroplan’s requirement of activity every 12 months. In Canada, there are a few things that you can do, quite easily, to keep your account active, such as filling up gas at Esso, which most people do quite regularly. With US Airways miles, there is a little bit more effort required to keep your account active, such as ordering magazines, or taking surveys through e-rewards or simply buying miles when there is a promotion. The opportunities are there, but you have to be congisant of the fact that you need activity every 18 months. The US Airways dividend miles program does have its advantages and we have outlined the reasons when it would make sense to transfer Aeroplan miles to US Airways miles. Here are some reasons why you might be better off booking your flight through Aeroplan. US Airways charges a $75 “Quick Ticketing Fee” for award flights booked within 21 days of departure. Aeroplan has no such last minute booking fee. There are more restrictions on Stopovers with US Airways awards than Aeroplan. For example, US Airways does not allow a stopover for travel within 1 region and only allows it in a hub city. 1. For travel within the continental U.S., Canada and Alaska, a stopover is defined as a stay of more than 4 hours between connections (if there is a connecting flight available within 4 hours). If you’re traveling outside the continental U.S., Canada and Alaska, a stopover is defined as a stay of more than 24 hours between connections. 2. Stopovers are not permitted when travel is within one award region or for multi-city travel. 3. For travel outside the continental U.S., Canada and Alaska, you’re allowed one stopover per US Airways itinerary at a US Airways gateway or international destination (or in a partner hub city if you’re traveling on an award partner). US Airways hub/international gateway cities include Charlotte, Philadelphia and Phoenix. Please call Reservations for additional US Airways international gateways and partner hub cities. 4. Stopovers are allowed only for the most direct route of travel. 5. Stopovers must be included in the reservation when you book. You may not add a stopover once an award has been ticketed. 6. With Star Alliance Round-the-World awards, you’re allowed five stopovers in a forward direction toward the original departure city. The US Airways website is much much tougher to book awards on. Partner flights are not bookable online. If you do book a partner flight using US Airways miles, you will have to call the call centre. There is a “call center award ticketing fee” of $30. If you explain that the award can’t be booked online, they should waive this fee. The US Airways agents are known for denying valid routes (and allowing illegal routes) since they don’t know where various cities are. You may get lucky or you may have to argue with them. The way to do this transfer is through points.com. Here are the steps. See the screenshots below the steps for further clarification. You can transfer Aeroplan miles to US Airways at a reasonable exchange rate of 1000 Aeroplan miles = 840 US Airways Dividend miles. Next time you are looking at booking an award flight using Aeroplan miles, investigate whether it makes sense to transfer your miles to US Airways first and pay for it that way instead. 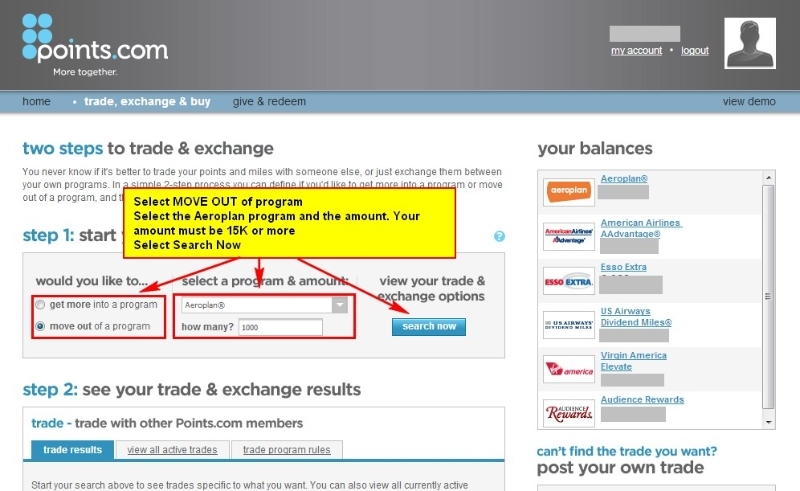 I just went to points.com and it’s quoting me only 732 Dividend Miles if I exchange 1000 Aeroplan miles. What’s up with that? Any idea? Thanks for checking this out. In terms of the exchange rate, I am not sure why you are getting a lower rate. I just checked points.com to see if maybe the exchange rate changed, but I am still getting 840 US Airways miles for 1000 Aeroplan miles. I am really not sure why your exchange would be less than mine. I have emailed points.com for clarification. Please be advised the country in which you live will have an effect on the exchange rate. That could explain the discrepancy. It looks like your exchange rate changes depending on your country (as dictated by the address in your profile). If you live in Canada (as determined by the address in your profile), then your exchange rate will be: 732 Dividend Miles for 1000 Aeroplan Miles. If you live in USA (as determined by the address in your profile), then your exchange rate will be: 842 Dividend Miles for 1000 Aeroplan Miles. It seems Aeroplan likes people who it thinks are Americans. 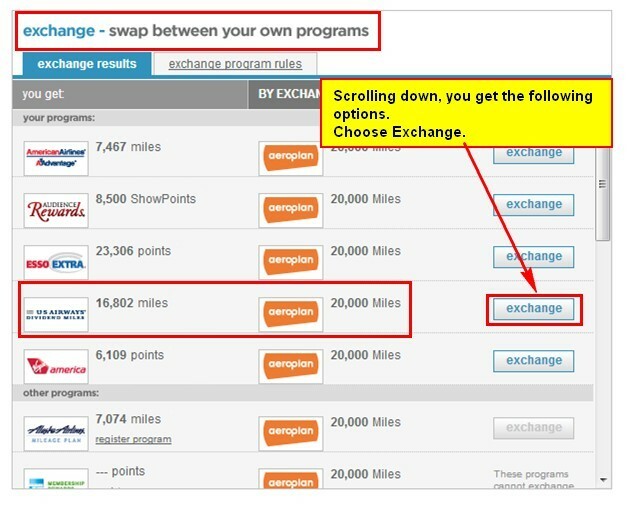 I tried transferring my Aeroplan miles tonight on points.com to US Airways and it is saying “These programs cannot exchange.” What can I do? I would contact points.com. Everytime I contacted them they have been very responsive. I would figure out the issue through them since I have been able to do it and others have also. One thing to bear in mind is the country issue. Is your profile address outside of Canada or US? If you notice there was an issue with different exchange ratios for Canada and US. Maybe if you have a European address or African address exchanges may not be allowed? Try changing that address to your Canadian one and see what happens then. I was a little confused by this – when I went to see how many USAIR points it would cost for a roundtrip ticket to london from toronto next august it was 125k – whereas on Aeroplan it is 60k? The US Airways online booking engine is broken. At USAirways.com, they only show you the price if you are flying exclusively on US Airways flights. In your case, there were no routings exclusively on US Airways planes at the “low” level. This is why US Airways shows the price at 125k. You will want to fly this route using a partner (Air Canada) or US Airways. In this case, you are going to have to call in the itinerary to the phone agents. There is no fee for this phone booking though since you can’t book it online. We agree – it’s a good idea to apply for the Barclays US Airways Mastercard with the 30,000 (40,000) miles sign-up bonus while the card (and the airline!) is still around. There are some crazy good values in the US Airways award chart that will likely go away soon! Just a quick note that the US Airwyas Barclay card is a US resident card. It is a great card to grab right now, but just be aware that you cant get it as a Canadian, unless you have a US SSN and US Address. 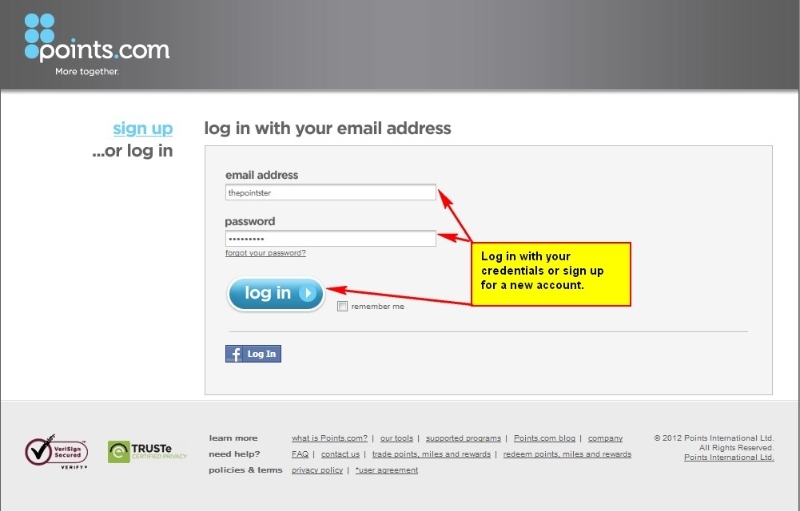 Don't subscribe All Replies to my comments Notify me of followup comments via e-mail. You can also <a href='https://www.creditwalk.ca/comment-subscriptions/?srp=615&srk=2648578ecea05c83754707575dc5a494&sra=s&srsrc=f'>subscribe</a> without commenting.